Do you have a dogs ? And you cant go with them anymore to the beach in Playa del Carmen or Cancun ? But you do want to spend a fantastic weekend with your dogs ? Have them playing and running on the beach ? Swim in the sea? No neighbors around? Then Our Pet friendly package may be the special offer you are looking for. In our photo album on Facebook called “Return guests at pet-friendly Hotel Maya Luna” you can see lots of photos of happy dogs at the beach of Maya Luna. 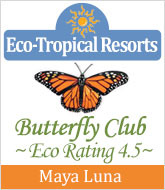 Make your reservation now and send an email to info@hotelmayaluna.com. We will answer you as soon as possible. With a downpayment of 50 % an OXXO or with a debit or credit car your reservation is secured.